Pomegranate juice gives these beautiful jellies their tangy taste and vibrant color. You either squeeze and strain the juice from pomegranate seeds, or bottled juice is available in many supermarkets. These treats are refreshing in any season and make a perfect additional to a party platter. 1. Lightly wet a pan 8x8 square. 2. Stir the gelatin with 4 tbsp water in a small bowl, let soften. 3. Combine the pomegranate juice, sugar and corn syrup in a medium saucepan over medium heat, stirring until sugar dissolves. 4. Bring to a boil and stir in gelatin, stirring until gelatin dissolves. 5. Pour hot jelly into prepared pan and allow to cool and set overnight in refrigerator. 6. 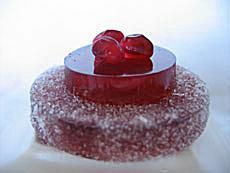 Once jelly is set, it can be cut with a wetted knife or cookie cutters. Finished jellies can be rolled in granulated sugar or left plain. These candies are beautiful when stacked and layered on top of each other. Try alternating sugared and plain candies, and try topping them with pomegranate seeds.